Warning: Arrow contains PG-13 level content. Spoilers included. 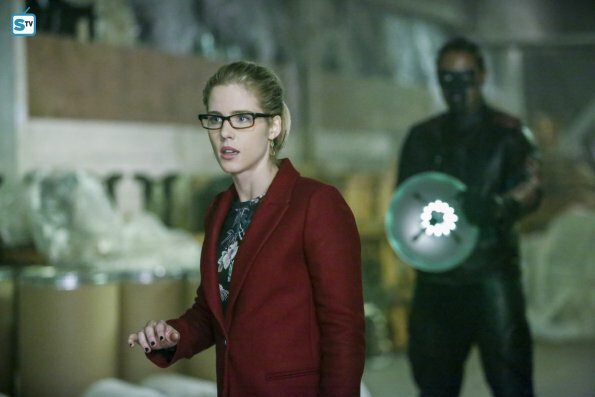 Black Siren poses as Laurel Lance to infiltrate the Arrow bunker, but Felicity uses her to track down Prometheus. Meanwhile, Oliver asks Adrian Chase to help with Diggle's case. Team Arrow is still a bit shaken up about Evelyn's betrayal and everything that's been happening with Prometheus. Curtis is feeling the weight of it all more so, which is why it's fantastic that Renee stepped up and encouraged him during this episode. Renee isn't usually the one to get soft, but I'm glad he was able to help Curtis see his worth. Stay strong, guys. Felicity is always the best (except when she's not acting like herself), and she was the best in this episode. Her paranoia about Laurel helped save them. Everything she did in this episode was phenomenal from confronting Laurel to forgiving Oliver to boxing in order to release pent up frustrations to using her genius ideas to track Prometheus. It was fantastic. While Oliver still blames himself (come on, man) for, well, everything, it was nice to see that he does still have hope for people. Oliver likes to see the best in people, and it's good that he believes anybody can be redeemed. Thank you, Ollie, for being a ray of sunshine. I'm actually surprised how much I enjoyed Adrian Chase in this episode. I've been wary of him and his intentions, but the way he handed Diggle's case and the General guy was great. He's definitely someone you want on your side, and he knows his stuff. You go, Adrian Chase. I knew it wasn't going to be Laurel. She was acting weird, her story about Sara saving her didn't make sense, and I knew they wouldn't pull a fast one on us this soon. (Not when Prometheus' reveal is supposed to blow our freaking minds.) But I am glad it was Black Siren and not something else. It was nice to see the effects of Earth-2 coming into play again. And it was fun for Black Siren to return with her abilities and her "dark queen" outfit. The flashbacks during this episode were kind of boring. They did connect with the present day events, especially with stuff Oliver said to Laurel, but nothing happened. I couldn't even remember who anybody was or how Oliver got caught by these other bad guys. I didn't even care that much about the archer saving him and revealing she's Talia al Guld. While I liked Adrian Chase's intervention with Diggle, the side plot of Diggle in jail is just so-so, in my opinion. I could really care less. I'm not at all worried about how it will turn out. And I don't even know what the point of the last few episodes were if he's just going back to jail. Again. Like why even bother breaking him out? He didn't do much while he was a fugitive. The episode was okay. It wasn't the rip-roaring explosion of fun and action I expected, but it wasn't bad. There was a lot packed into it, a lot of threads to follow for the rest of the season. But a lot didn't happen as well. There wasn't that much action or revelation. Ooh, not actually Laurel: I could have guessed that. I'm not even worried about Diggle. And Prometheus didn't do anything this episode. So where does that leave us? Apparently a lot of talking and crying and nothing extraordinary. Well, there are more episodes to come and hopefully they'll turn up the excitement. What did you think of "Who Are You? "?